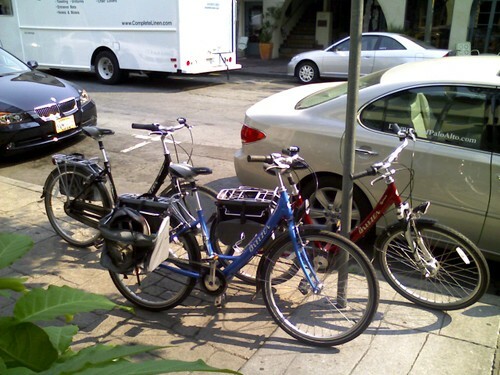 I snapped this photo of three Breezer bikes outside a Palo Alto cafe. Three women rode up separately and then sat together for a chat and some coffee. This photo says everything about the state of marketing and product design today. That is, marketing = design = marketing. You can design a bike to market itself, and you can design your marketing to make your product design more meaningful. I’ve written before about the great bikes designed and marketed by Breezer. They are what they are: a turnkey commuter bike, all sorted out for you, ready to ride and fun to ride, with just enough aesthetic flourishes to make you look back at the bike once or twice once your reach your destination. In a world captivated by spandex-carbon-fiber-titanium-tour-de-france bikes, the Breezer bring a little bit of the Dutch bicycle aesthetic to the US, leavened with some wild California hippie mountain bike DNA. It’s the kind of product that makes for happy owners, and happy owners like to tell other people about their happy experiences (as I’m doing now). In the parlance of Godin, they sneeze, and other people catch the virus. In this case, it’s a Breezer virus, transmitted from friend to friend. Californians can find refuge in Orange County or the Central Valley. politics with those who disagreed with them. Severe segregation is a societal ill, but is in some ways a boon to marketers. 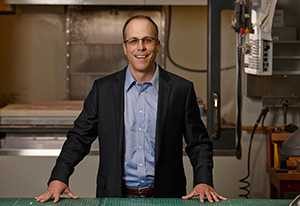 Make a bike that appeals to wealthy, liberal, educated, gregarious, retired boomers? Super! Now you can target them by zip code. Once you get one maven in there with your offering, you can find creative ways to help that maven spread the word… and as they sneeze, the virus will spread fast and wide and deep. Begin with Desire: create something remarkable. Do it to the hilt. Weave sticky stories: design memes that are unavoidably memorable. What are the consequences of the “Big Sort”? Is Design encouraging less diversity? At the macro level, the trend of professionals moving to smaller communities to be with others who are similar is one thing. They are able to do so with the advent of technology and the demand for their skill set in diverse places. However, this also suggests to me a pattern of designing for the comfortable and familiar. That gets me wondering–are we painting ourselves into a corner with things like Pandora and the Genius feature on iTunes8? Sure I may get more of what I like, but does what I like change much? Or, if I live in a planned community of people very similar to me, I may be reducing my potential for divergent thinking. Does the overall movement in design discourage divergent thinking? I think there’s a time and a place for things that mesh well with the Big Sort phenomenon (I don’t know how much control one has over this pattern). But I also think finding and designing for opportunities that encourage new patterns and relationships is critical. Starting with what’s common and building bridges outward to what isn’t. If graduate school is a melding of cultures and ideas (one side of the pedulum), what’s the other side of the pendulum look like years later where people tend to form families, have kids, and live in communities that are much less diverse (e.g. the ‘burbs). Is it community design?